Core Description: The Stem Cell and Xenograft Core (SCXC) is a comprehensive resource laboratory that integrates a viable tissue bank of normal human hematopoietic cells and hematopoietic malignancies with a full range of xenograft services. The SCXC offers a wide variety of xenograft services from training to full-service experiments. 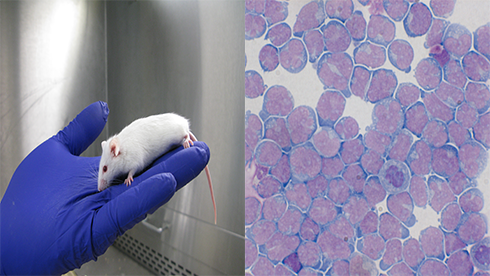 The Core maintains a large breeding colony of immune-deficient (NSG) mice for users' xenograft studies. We also offer human immune system (CD34-transplanted) NSG mice for a wide variety of studies ranging from gene therapy to HIV. Experimental animals are housed in dedicated BSL-2 animal barrier space equipped for whole body irradiation and all necessary procedures and survival surgeries. Currently established xenograft models include normal human CD34 and leukemia engraftment, human iPS and ES-derived teratomas, human skin grafting, orthotopic human ovarian, hepatic and pancreatic tumor cell injections, renal capsule implantation. We also offer access to a dedicated optical/fluorescence (IVIS Spectrum) imaging system located within the Core's BSL-2 space. For consultation or questions, please contact Gwenn Danet-Desnoyers.